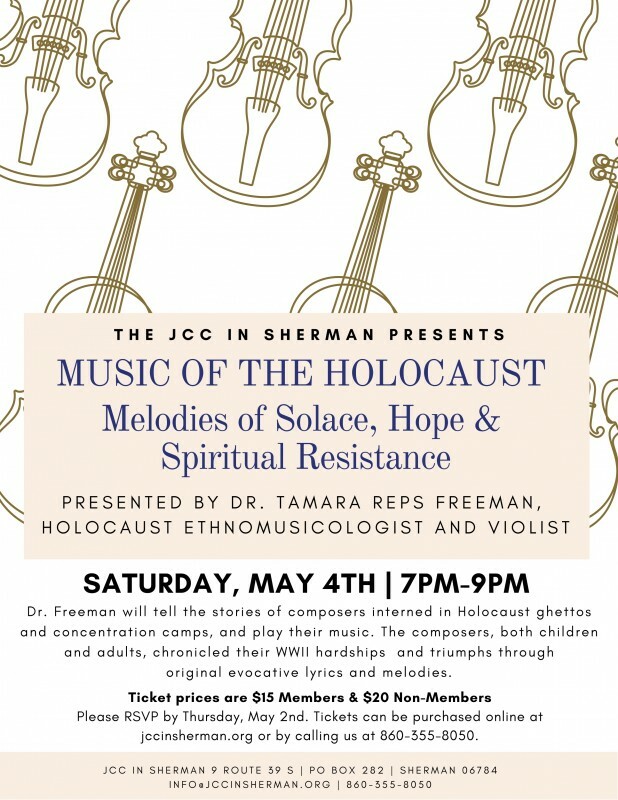 Dr. Freeman will tell the stories of composers interned in Holocaust ghettos and concentration camps, and play their music on her 1935 Joseph Bausch viola that was rescued from the Shoah and secretly shipped to the U.S. The composers, both children and adults, chronicled their WWII hardships and triumphs through original evocative lyrics and melodies. Dr. Freeman will lead community singing, to help the audience experience first-hand the power and passion of this historically significant music. These musical memoirs help us learn the legacies and lessons of the Holocaust, and to Never Forget. Dr. Tamara Reps Freeman, Holocaust ethnomusicologist, educator and recitalist is the musicologist for the Association of Holocaust Organizations, the international alliance of Holocaust museums, state commissions, and education programs. She is an adjunct professor of Holocaust music at Montclair, NJ State University, John J. Cali School of Music where she coaches two graduate ensembles on archival Holocaust Art Music. Dr. Freeman is guiding Montclair State University in creating our country's first Institute of Holocaust Education Through the Arts. Dr. Freeman is a concert violinist and violist. She performs lecture-recitals of music composed, sung, and played in the WWII concentration camps on her 1935 Joseph Bausch viola, a rescued Holocaust relic. Her many performance venues include the Chautauqua, NY Summer Institute, the U.S. Holocaust Memorial Museum in Washington, D.C., the Belz Museum in Memphis TN and the NJ State House. Dr. Freeman travels across the country, teaching classes and faculty workshops based on her dissertation, Encouraging Racial Respect Through Holocaust Music: An Interdisciplinary Curriculum. Her curriculum is the first of its kind in the U.S. In 2014, Dr. Freeman received an alumni award from the Crane School of Music, SUNY Potsdam, for creating one of the five most significant music education innovations in the school’s 125-year history. In 2018, Dr. Freeman was the artist director and conductor of our country’s first All-State Holocaust Music Concert religions sang Yiddish music composed during the Shoah for Teens. The Concert took place in Nashville TN, where 250+ students (ages 8-18) of all cultures and Publications include “Giving Voice to Democracy in Music Education, Diversity and Social Justice,” Routledge Publishers, 2015, and the music curriculum for the 2014 Emmy nominated film, “Defiant Requiem,” JourneysInFilm.org. Tamara Reps Freeman, and her husband, Barry Freeman Ed.D. reside in Saddle River, NJ and New Fairfield, CT. They are proud members of the JCC and Temple Sholom. In her free time, Tamara enjoys dance and Pilates classes, studying Torah and Haftarah, hiking, cooking and baking. www.HolocaustMusic.org.